Here you have the opportunity to load and continue a game previously saved on disk. If you play from disk, saved games are always searched for on the saved game disk PIZ-GAMESAVE (AMIGA only) or, if you play from a hard disk, in the GAMESAVE directory which was created automatically during installation. The saved games will be displayed in a saved games window. Choose a game and click on it. 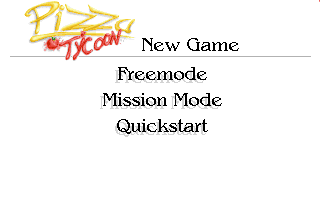 If you do not wish to load an old game, click outside the window to get back to the main menu. Here you do not have a specified aim. Simply play as long as you like or until your character fails. You can move around freely from city to city. You choose a curriculum vitae you want to follow. Your aim now is to relive this life as closely as possible. The game ends when you have reached the final stage of your chosen life. All the available lives are displayed in the mission window. Click on a mission to look at it in the left window. Click on OK to play this mission. With the option "Disk", you can also load a curriculum vitae you have saved onto disk as a mission. These are loaded either from your PIZ-GAMESAVE disk (AMIGA only) or from the GAMESAVE directory (if you are playing from hard disk). 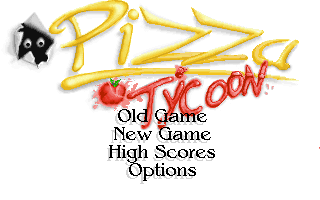 This is a quick way into Pizza Tycoon. You will be offered a choice of one or two default restaurants (high or low quality). You will then choose a Character Name and Restaurant Name. With 100 different characters you will be spoilt for choice! Each character has individual values. For a detailed description of these see the section ThePIZZA TYCOON characters. In the left window, the values of the character currently shown in the picture are displayed. The character is the owner of the company that is highlighted on the right. Scroll the list of characters up or down using the arrow icons. You can change the first name and the surname of every character by clicking on his name box and typing in his new first name and surname separated by a space. However, if you use the arrow icons to scroll the list again afterwards, the name you have typed in will be lost because the characters must be reloaded every time. In addition to the characters provided, you can also use your own characters from a disk. These must have been saved with Save a character on your PIZ-SAVEGAME disk (AMIGA only) or in your GAMESAVE directory (when playing from hard disk). This feature allows you to increase the number of available characters as you wish. In the course of the game, the values of your character will change. If you save it on a disk, you can swap this character with your friends. All competitors, not only human players, can be assigned characters of your choice. This means that you can determine the difficulty level of the game individually. In the right-hand screen window, the company names of the competing restaurant chains are displayed. The uppermost name is activated and represents your restaurant chain. You can change this name at random by clicking on the currently active yellow box and typing in a new name. At first, the player window is set to one human player, while all the competitors are controlled by the computer. If you want several human players to take part in the game, just move the line between the human and the computer-controlled opponents down using the arrow icons. Keep doing this until the desired number of players is colored green (i.e. "controlled by human player"). When you are happy with all the settings, click on OK. Now a map will appear so you can choose the city from which you would like to start your game. Here you can have a look at the scores you have achieved in previous games. You will be shown the most important information about those games. You can select various settings concerning the game. 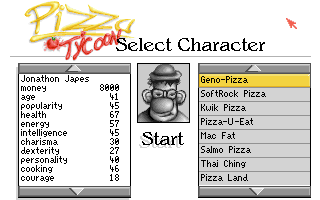 Once you have configured PIZZA TYCOON according to your liking, the settings can be saved.